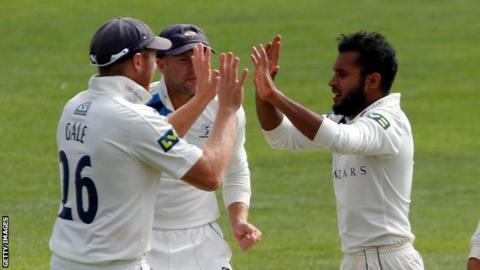 Adil Rashid boosted his chances of an England Test call-up as Yorkshire beat Hampshire by 305 runs at Headingley. With the squad for the first Test against New Zealand due to be announced on Thursday, leg-spinner Rashid claimed 4-48 for match figures of 8-118. Hampshire were 37-4 at the start of play, having been set a target of 449. And although Will Smith added 56 with Lewis McManus (28), he ran out of partners on 64 not out when they were dismissed for 143 in early afternoon. Rashid was a member of England's tour squad in the West Indies, but did not appear in any of the three Tests. And after Jack Leaning dropped a difficult chance offered by Smith from the bowling of Jack Brooks, he made the initial breakthrough for Yorkshire by bowling nightwatchman James Tomlinson. Tim Bresnan soon accounted for Sean Ervine, but debutant McManus showed a mature head as he kept Smith company in a stand that used up 30 overs either side of lunch. He was eventually caught behind off Will Rhodes and Rashid then took two wickets in successive balls as Gareth Berg swept a catch to Brooks and Andre Adams was taken at slip by Bresnan. Last man Fidel Edwards survived the hat-trick ball at the start of the 27-year-old's next over, but soon fell to seamer Steve Patterson as the reigning champions wrapped up their second win of the season. "For Rashid to get back into his stride so quickly was great news and whoever the next England coach turns out to be, he may be knocking on his door. "Bairstow's innings (on Tuesday) was a massive one and a big turning point because at 114-4, things could have gone against us. "Lyth also adapted quickly to English conditions and all three lads who were in the West Indies contributed to the win and showed their quality." "The ability to remain patient helped Yorkshire to the Championship last season and it helped again in this match. "Hampshire remained defiant for a time on the final day, but to their credit, the champions plugged away and got their reward. "Adil Rashid, bowling with confidence and skill, produced two wickets in two balls to end with figures of 4-48 as Hampshire were bowled out for 143. "Yorkshire are just behind the leading pack in Division One and unbeaten in four games. Hampshire are still searching for their first win this season."